It seems like it’s been forever since I’ve posted anything but sweets! I mean I love sweets, but let’s get real we can’t indulge in those all the time. As much as I would like to because that would pretty much rock my world. I’m all about the sweets. After I had RyRy in November I had a hard time losing the weight. At first it fell off and it was like magic. I was all like oh I got this, this will be easy! Then it stopped. Road block. Nothing happening. It was the middle of winter in Minnesota which is depressing enough but I couldn’t get my jeans back on. I finally broke down and went and bought a bigger size so I didn’t have to keep wearing my maternity clothes. I was pretty much depressed and felt like I was an ugly slob. I had all those Mommy hormones going on and none of my clothes fit. I was a mess. March came and I went back to work squeezing into a few of my “Fat Pants”. I began to think this could just be the rest of my life and I should just buy new pants but I couldn’t bring myself to do it. I’ve struggled all my life with weight. Back when I was a junior in high school I lost 50 lbs. Thanks to eating better (not that I knew much about it but I struggled through) and playing basketball. I was at a “healthy” weight finally for the first time in my life. I could walk into a store and actually buy clothes off the rack. Shopping for clothes for my senior photos was actually enjoyable for the first time in my life. It was life changing. I was happy, I finally had found my groove in life and I had self confidence to celebrate in my senior year of high school which took me through college and my first years of being and “adult”. Sure I struggled with it pretty much every day. I’d gain some weight and then I’d focus on it and lose it again. I had a “set” weight in my head that if I got to that point it was time to focus on the struggle again. I wish I could say it got easy at some point, but it never did. So finally after I went back to work and was trying to find my new routine I started thinking that things had to change in the weight department because my self confidence was gone. Sure, I wasn’t obese but I wasn’t happy in my own skin either. I started focusing on working out again, but I was till struggling. I noticed that my coworker was having fabulous success on this lifestyle plan “Isagenix”. I watched quietly as she lost weight and finally I asked about it. I jumped on the bandwagon and haven’t looked back since! Well except for those four pounds I just gained back and I need to get off again! A lot of it had to do with eating “cleaner”. As much as I love my pasta I had to learn to enjoy it once every few weeks instead of nightly. Gasp. I know. 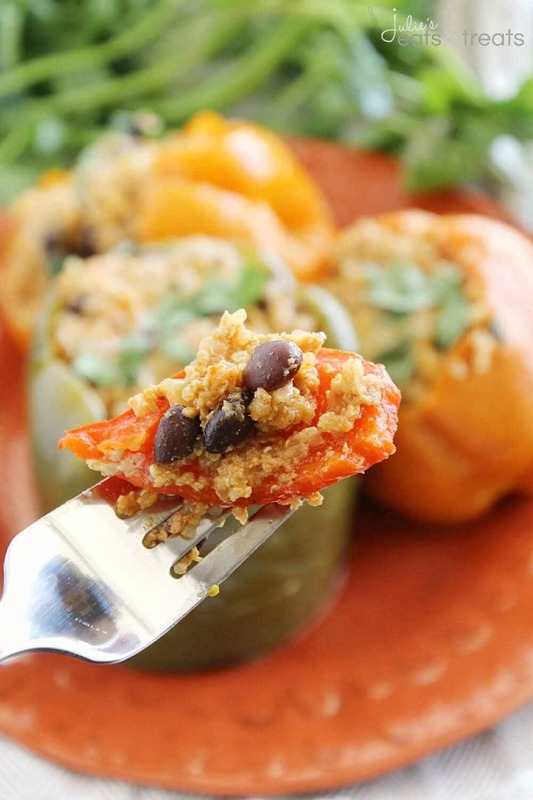 These delicious Light Crock Pot Chicken Stuffed Peppers are my take on eating a bit healthier. I couldn’t give up my beloved Crock Pot so I knew I had to find a few things to enjoy in there with my new eating habits. These are packed with flavor and leave you feeling satisfied! 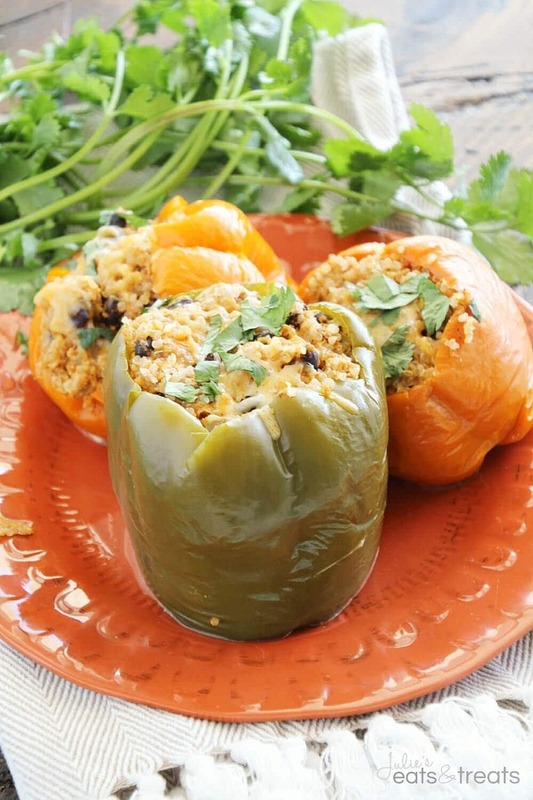 Light & Delicious Peppers Stuffed with Quinoa, Black Beans, Onions, Chicken and Cheese then Slow Cooked to Perfection! Cut off the tops of peppers and clean out the ribs and seeds. 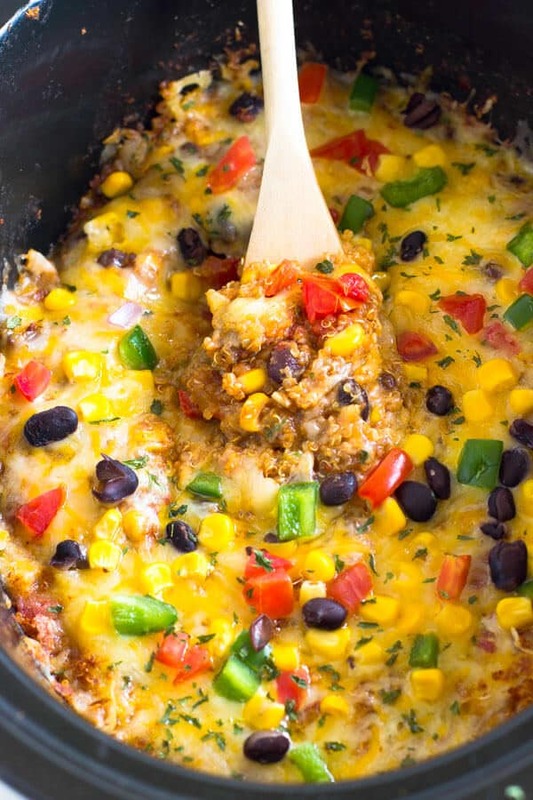 In a large bowl mix together quinoa, black beans, chicken, enchilada sauce, cumin, chili powder, onion, garlic and 1 c. cheese. Fill each pepper with mixture. Pour 1 c. of water on the bottom of slow cooker. Place peppers in the slow cooker so they are sitting in water with the top up. Cover and cook on high for 3-4 hours or low 6-8 hours. Remove lid and sprinkle with remaining cheese and cilantro. Cover and let cheese melt. Serve with toppings! Crock Pots all cook at different temperatures, please adjust accordingly. 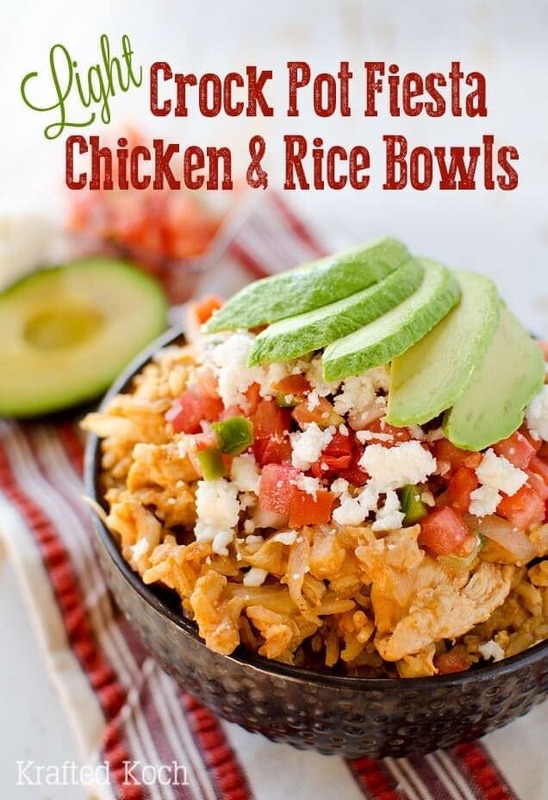 Craving More Mexican Crock Pot Recipe? I love stuffed peppers. And these look so flavorful and divine. YUMMY! 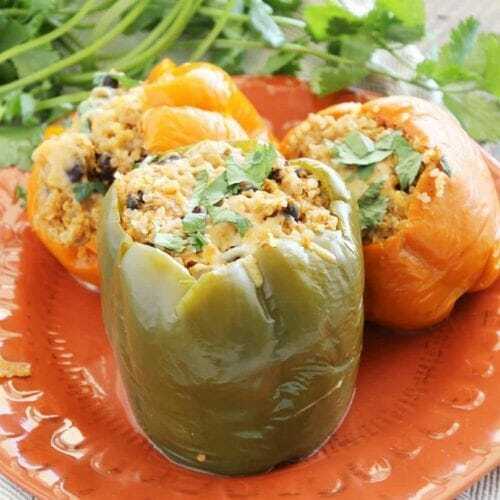 Stuffed peppers are one of my favorite dishes. I love that your version is made is a crock pot. Looks delicious! 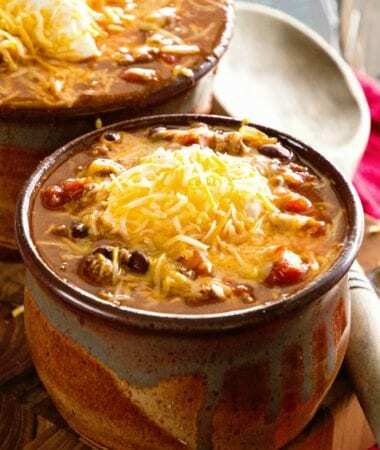 These look so tender, hearty and delicious, I would love for dinner and I totally like how easy they are to make! Wow! They look incredible! I just love stuffed peppers! I so hear you on the baby weight!! I have a hard time as well!! But I think you look great in your stitch fix pics! And I love the mix you have stuffed these peppers with!! Yum, I wish I had some of these waiting for me for dinner tonight! 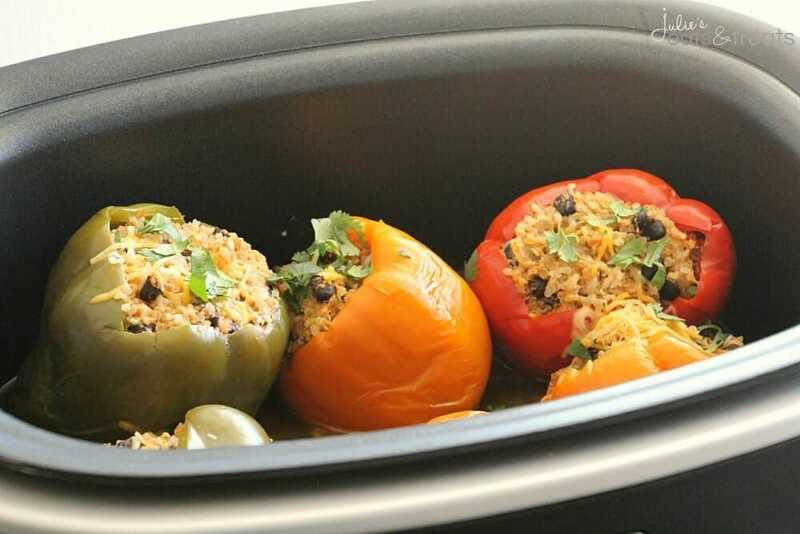 I love stuffed peppers but have never tried them in the crock pot. They look so good!